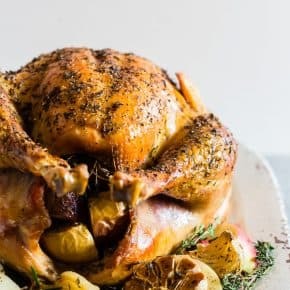 This garlic herb maple roast turkey is packed full of flavor with just a touch of maple syrup sweetness. It’s the perfect addition to any holiday table! This post is sponsored by Diestel Turkey Ranch. All opinions are 100% my own. Can you believe that Thanksgiving is almost here? I keep forgetting that it’s November let alone that t-day is in less than 2 weeks. Eeeeeek! Good thing I finally got my head in the game and was able to throw together this AWESOME turkey option for your family holiday meal plan. Growing up turkey was basted in butter (never a bad thing!) and sprinkled with some basic herbs. Was it good? HECK YES! BUT sometimes I crave something a little bit different. In the past, I made for you an herbed mayonnaise roast turkey and an adobo butter turkey but this year I’m bringing you a garlic herb maple roast turkey. OMGOMGOMG it’s the perfect amount of salt and herbs with just a hint of dark maple syrup flavor. 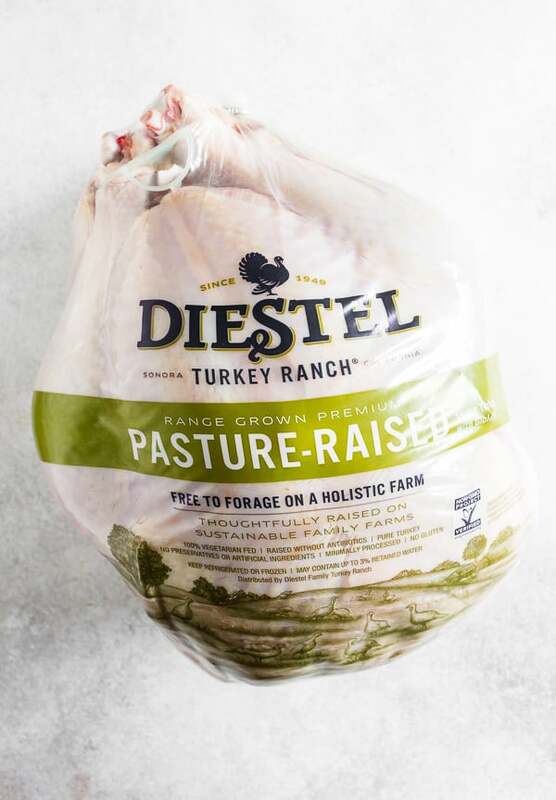 I also teamed up with Diestel Family Turkey Ranch again this year because there is no sense in bringing turkey if it’s not quality turkey – am I right? If you don’t remember (or you’re new to Nutmeg Nanny – HI!) Diestel practices sustainable farming methods, which means a few different things. One – their birds are raised almost twice as long as given nearly two times as much space as conventional birds and their (which just so happens to be this pretty little bird here!) is awarded a 5 rating from the Global Animal Partnership. Oh, and they have been doing this 1949, so they know a thing or two about turkeys. 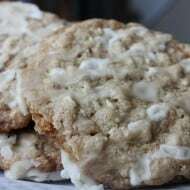 You’ll also love the 100% vegetarian diet of grains milled daily on the for their turkeys and the fact that you can get lots of delicious goodies from their online store! 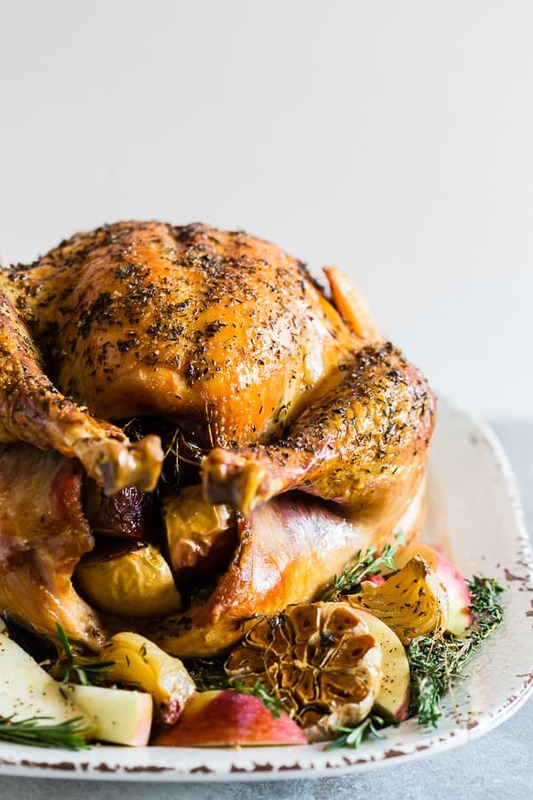 In addition to their online availability, Diestel’s Pasture-Raised Turkeys and all of their holiday birds can be purchased at select independent, natural, upscale, and conventional food stores across the country. Visit the Diestel store locator for more info and connect with @DiestelTurkey on Facebook and Twitter. And don’t forget to check out Diestel’s year-round turkey products, like their Non-GMO Project Verified deli slices and turkey burgers! Ok, more about this turkey. 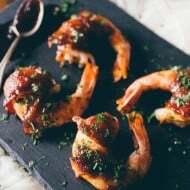 It’s slathered in melted butter, sprinkled with kosher salt and minced fresh herbs and then drizzled with just a touch of maple syrup. Oh, and where does that garlic come from in the title? Well, the cavity is PACKED full of fresh garlic and chopped apples. This baby is so flavorful with just a hint of sweetness. Trust me, you’ll LOVE IT! Looking for a turkey of your own? 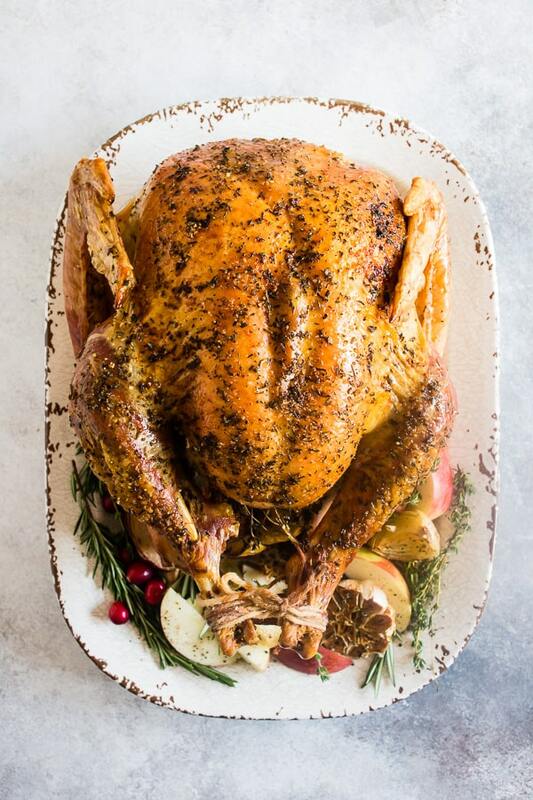 Use this code NUTMEG20 and you’ll get $20 off any whole turkey and cook-in-bag breast roast, no limit per customer, maximum discount $40 per order, valid through Dec. 14th 11:59PM PST, online only. Remove your turkey from its packaging, rinse and remove the giblets. Add turkey to your roasting pan and using your hands cover the whole outside of the turkey with melted butter. Sprinkle the outside of the turkey with kosher salt, black pepper, rosemary, thyme and sage. Fill the cavity of the turkey with the heads of garlic, apples and onion. If you have any leftover fresh herbs feel free to also add them to the cavity of the turkey. Place your turkey into the oven and roast for 30 minutes. After 30 minutes turn down the heat to 350 degrees and cook for about 2 hours. 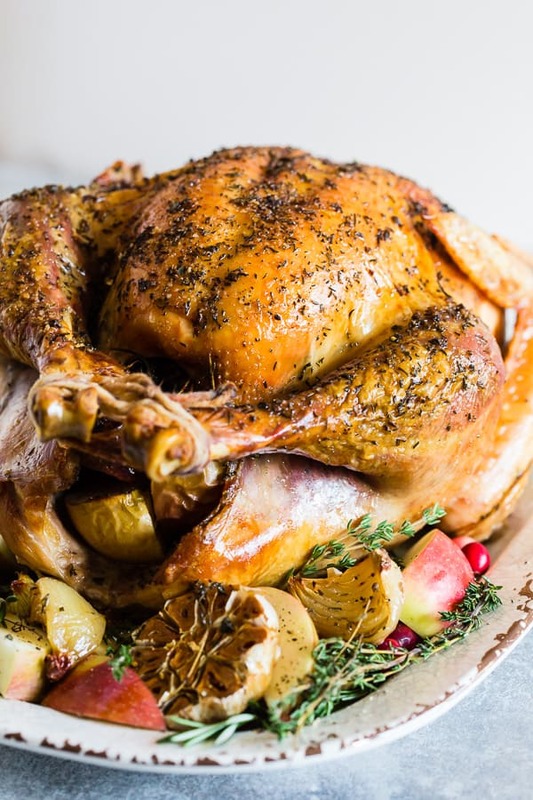 Remove from the oven, drizzle the outside of the turkey with maple syrup and add back to the oven and continue cooking until the bird reaches an internal temperature (when checked near the thigh) of 160 degrees. Then let the bird rest for at least 30 minutes before carving. If the bird starts to brown too quickly simply tent it lightly with foil so it does not burn. 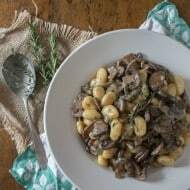 OMG – This looks amazing! 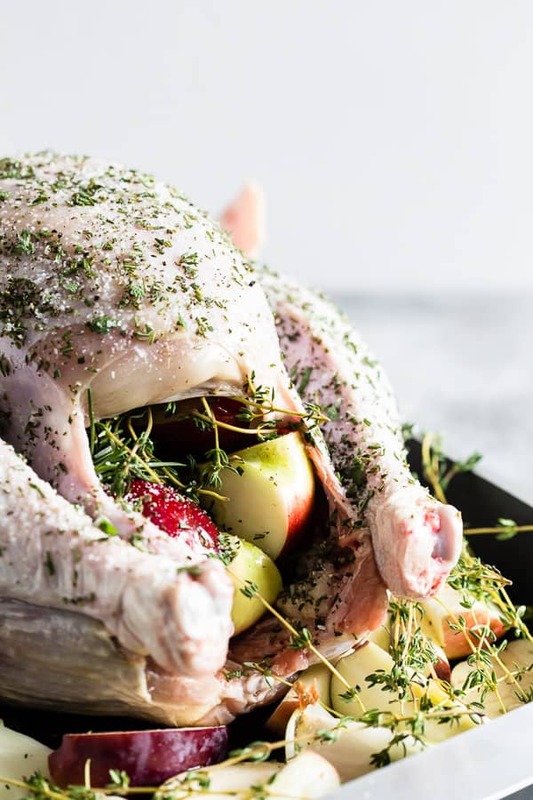 Question though, do you brine your turkey before cooking? I usually do but on the fence about it this year. That is a beautiful turkey!! Happy Thanksgiving, Brandy!! Turkey is meant to be the star of the show and this one definitely is!! Looks amazing! That turkey looks absolutely perfect! Quality makes such a difference! I’d love to try one of these turkeys, especially this on — love the maple flavor! This Turkey looks so good! Great Thanksgiving turkey for sure!